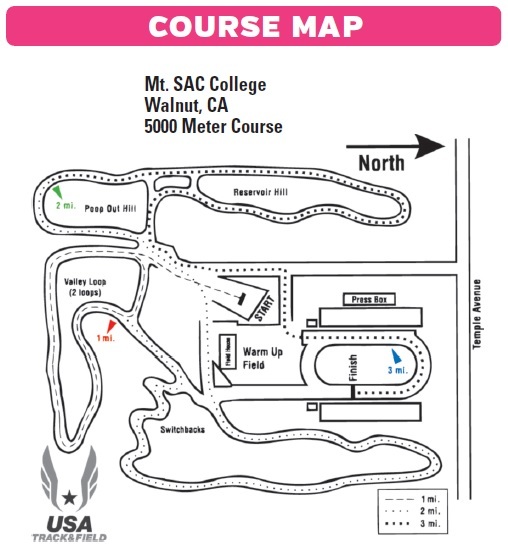 Distribution of race numbers, race information and New Balance/Foot Locker Cross Country backpack takes place from 10:00 a.m. until 6:00 p.m. at Mt. SAC College, Building 50 - G, Fieldhouse. Photo ID required for pick up. Distribution of race numbers, race information and New Balance/Foot Locker Cross Country backpack takes place from 6:30 a.m. until 8:30 a.m. at Mt. SAC College, Building 50 - G, Fieldhouse. Please make every attempt to pick-up your race number before Saturday. On race day, the lines can be long and we cannot guarantee you will be able to get your number in time for your race. Photo ID required for pick up. 1. All members of the group must have registered and paid on line. 2. All group members must list 'Group Name' in exactly the same manner when they register. Example: Members of "Team Butterball" must list their affiliation as "Team Butterball". Simply putting 'Butterball' or 'Butterball Team' , or "TB" will not work. Tell your team members how you want them to list your team name. 3. All group members must list a "Group Leader" as well with the group leader phone number. 4. Registration must be completed by 11:59 PM, Friday, November 24th, 2017. 5. Once all of your team members have registered and paid please send an email to westgroup@footlockercc.com. Tell us your team name and how many runners have paid and registered on line. Send a phone number in order for us to reach you if we have any questions. 6. You will receive one Foot Locker West Jacket for every ten (10) athletes on your list. (example: 27 athletes- receive two jackets, 31 athletes- receive three jackets) Tell us what sizes you would like in your email to Ron Kamaka. 7. Runners in your group who miss this deadline must register as Individuals and wait in line at Pre Race Pick UP. 8. There will no longer be any opportunity for an individual representing a group but who did not register AS A GROUP to come in and pick up for their entire team on packet pick up day. We tried to assist the large groups in the past but there are a number of you now and it has created too many problems for us and the others waiting in line at pick up. Medals to the top 15 boys and top 15 girls in the Open Race - 8th grade and under division. Medals to the top 15 men and top 15 women finishers in the Open Race - post high school division. Please note that the only two divisions in this race are male/female. There will be no distinction made to grade or age. "All West Team" certificates for the top 24 runners (based on finish time) taken from the Frosh and Soph races. This is overall and not per grade level. Medals to the top 24 finishers in the seeded races. In addition, the top 10 finishers in the boys and girls seeded races will advance to the Foot Locker National Championships in San Diego the following Saturday. Every runner in every race will receive a short-sleeved New Balance/Foot Locker Cross Country backpack and a meet program highlighting the previous 38 years of Foot Locker races, as well as previewing this year's race. When this page loaded, the official time was 8:42:10 AM EDT.